In Mexico earlier this month, Momma and I enjoyed two blissful days at a beach club on the Sea of Cortez. We had to pre-pay about $27 per person, but this money went toward the same amount of food and drinks, and we ate and drank very well within that. 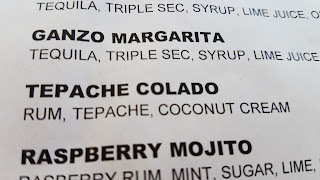 The first day, I discovered something new to me on the cocktail specialty menu: a drink of rum, coconut cream, and something called tepache I had to ask about. 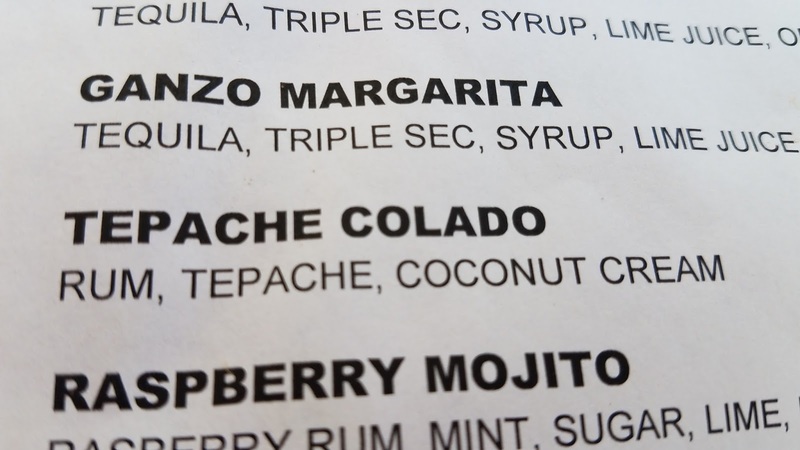 Well, as it turns out, it's a drink made from pineapple (or just the peels) and piloncillo, an unrefined form of sugar. 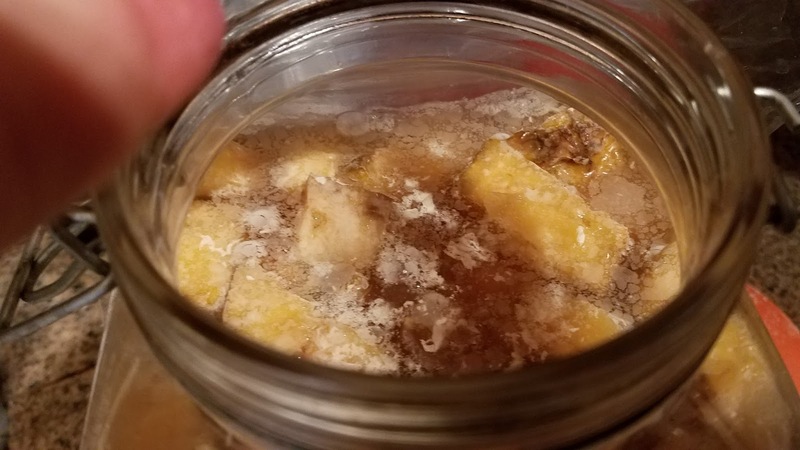 The peels of the pineapple hold the yeast that causes the fermentation, so there's no need to add a "mother" of any kind, although some add beer after a few days to speed it up. There are many variations of the recipe, of course, and I'll keep experimenting to find my happy number of days of fermentation. Start out as I did with about four days and you should have a lovely, refreshing mini-trip to the tropics in your fridge for way less money than a plane ticket. 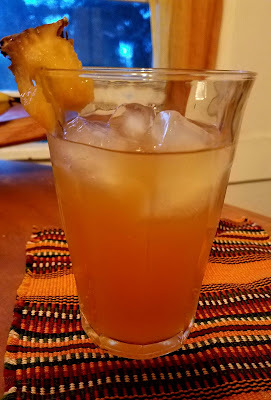 BTW: the local 99 Cents Only had ripe pineapple and piloncillo in stock, so this was super cheap to make! 2) Cut up the pineapple and put in a large jar (3 or more quarts), peels, core and all. You can even just use the peels and core if you want to use the fruit for something else. 3) Heat the water to dissolve the piloncillo or brown sugar. Add the cinnamon and cloves, then cool to room temp or thereabouts. 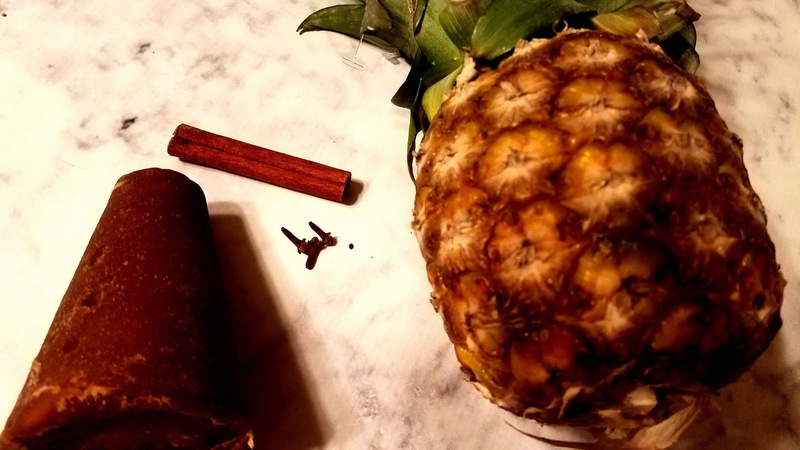 Once cool, pour over the pineapple. 4) Cover the jar with several layers of cheesecloth or a tea towel, held on with a rubber band. 5) Let sit in a warm,, dry place for 2-5 days, testing every day to see if it's where you'd like it to be. 6) When a white foam appears on top, skim that off. 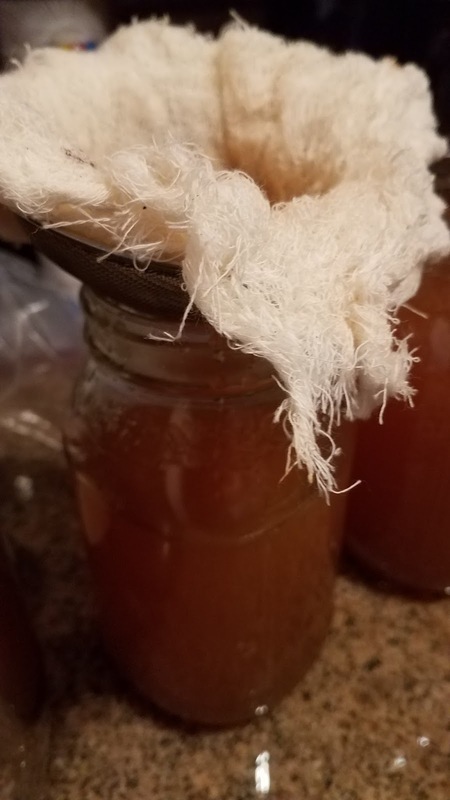 You can keep letting it ferment for another couple of days after that if you like sour drinks or more fizziness. 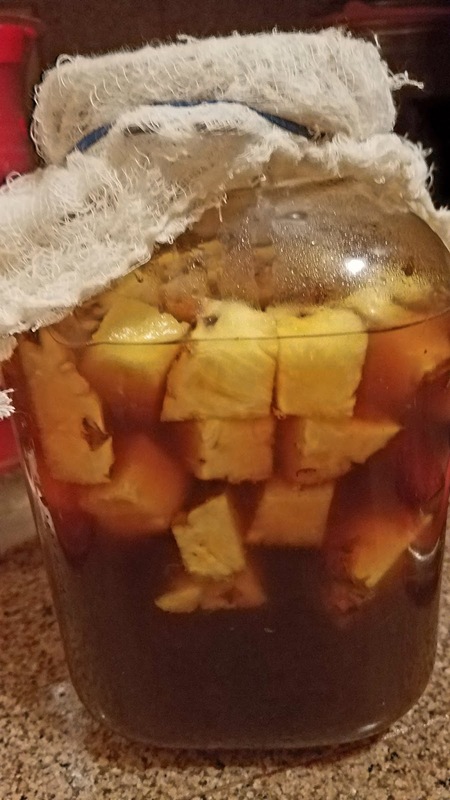 7) Strain out the pineapple (you can eat the parts with no skin) and filter the Tepache into a large jar or pitcher. It might need to be filtered twice if there are little white things floating in it, but you can use the cheesecloth in a fine mesh sieve to get out most of the cloves and pineapple skin debris. 8) Serve over ice or mixed into a cocktail. Enjoy your mini tropical break! 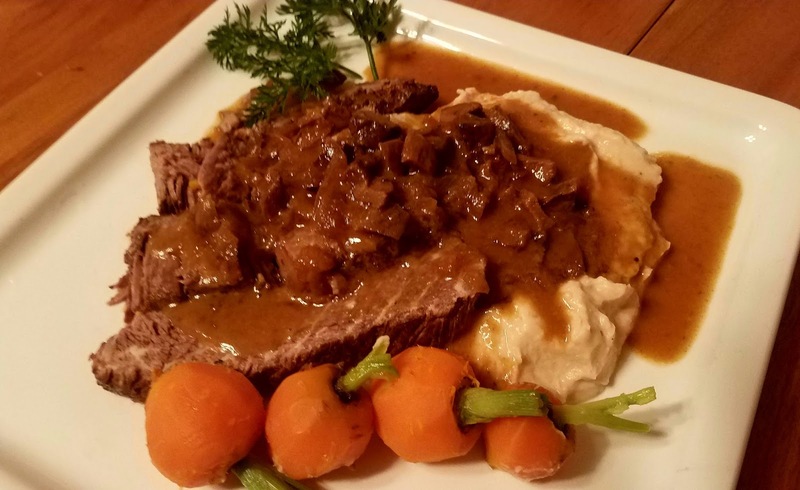 I'm not sure how I got my mind set on Pot Roast, but I'm so glad I did! The rainy season came early to California this year, and we're all grateful for the rain but a little bummed to miss what's usually the nicest weather of the year, September and October. 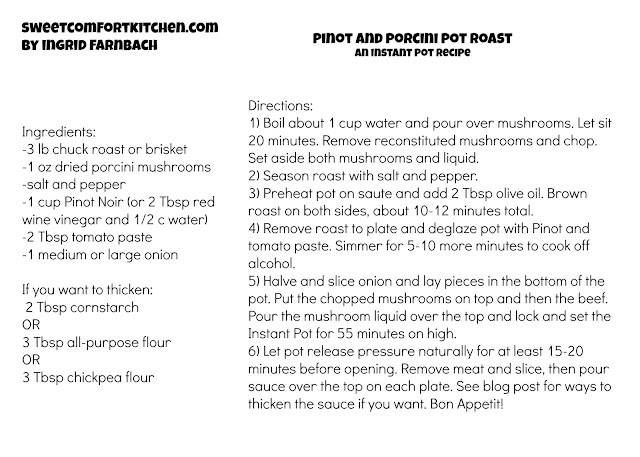 Pot roast is the ultimate Sunday Supper, hearty and, while time-consuming even with a pressure cooker, very simple. With such a heavy dish, though, it's important to have something fresh on the side. While the roast does its thing, steam some nice baby carrots and make a little salad with a light vinaigrette--you can even use the tender parts of the carrot greens for the salad. This serves 6 for a seated meal and takes about 2 hours total if you use the jus as is rather than letting it cool to make a thickened gravy with the fat, shaving at least an hour off the time for a traditional pot roast. 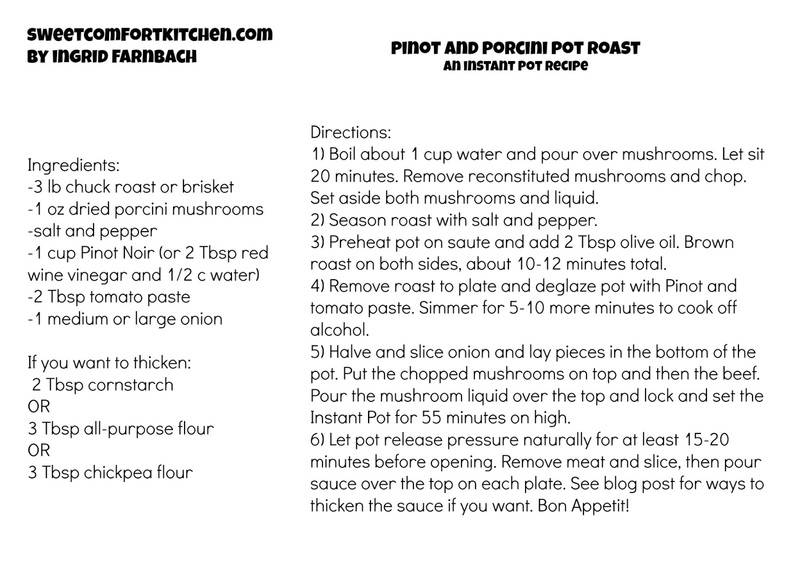 Recipe card at bottom. The other accompaniment I have here is a Garlic White Bean Puree from Fine Cooking Magazine. It tastes almost like mashed potatoes because of the cream, but with a lower glycemic index. It's a bit of work, but you can speed it up with two cans of beans instead of dry, or sub mashed potatoes if those are fine for you. 1. Prepare the mushrooms and the meat: At least 20 min before starting, put 1 ounce of dried porcini mushrooms in a heatproof cup or bowl and pour 1 cup boiling water over them. (If porcinis are unavailable or too pricey, get shiitakes instead. I got these in the bulk section, labeled by the horrifying price per pound, but about $4 for an ounce as opposed to $6 for a small packet.) Set a heatproof coffee cup or ramekin on top of the mushrooms if they're not submerged. 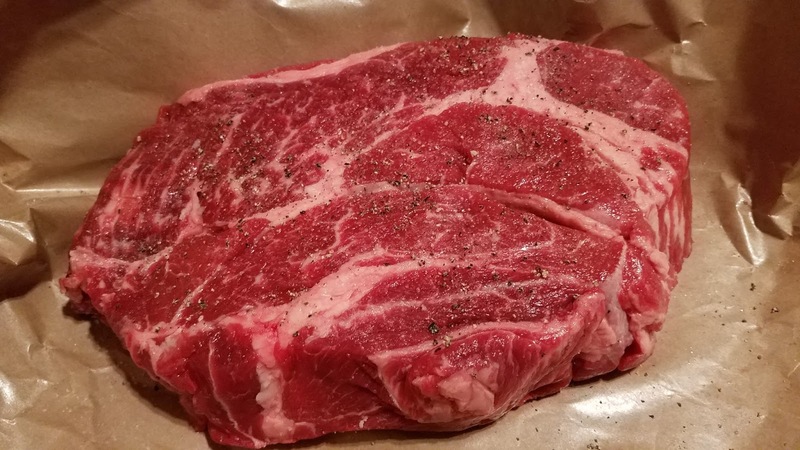 Season a 3 pound beef roast (chuck or brisket, whichever is on sale) with salt and pepper and let the meat absorb the seasoning while the mushrooms soften. Leave in the big pieces of fat for flavor--you'll be able to remove them once it's cooked. 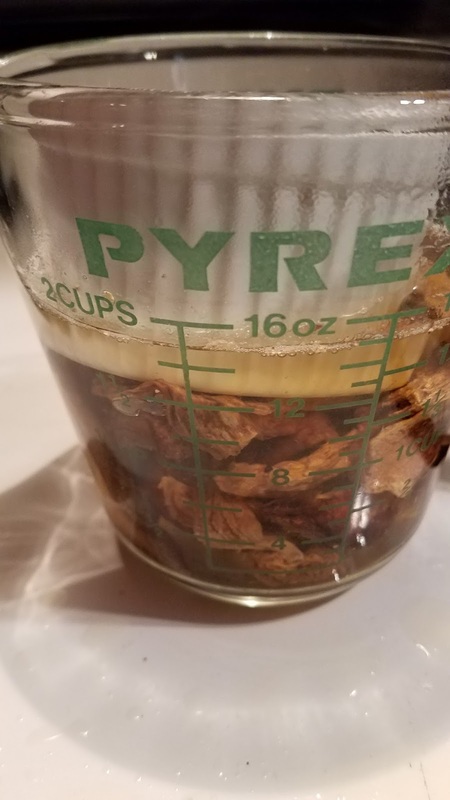 After the 20 minutes are up for the mushroom soaking, pour off the liquid, being sure to let any grit stay at the bottom of the first cup, set aside to use as the broth for the roast, and chop the reconstituted mushrooms. 2. 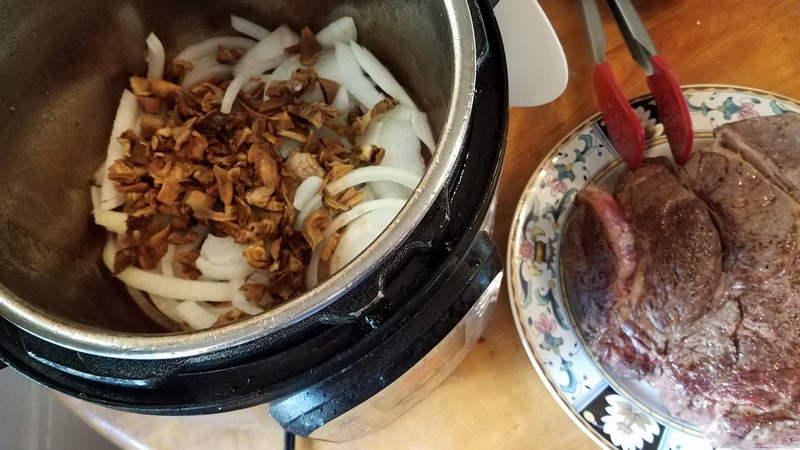 Brown the roast and chop the onions: press the "saute" function of the Instant Pot (or pre-heat a heavy oven-safe Dutch oven). Add 2 Tbsp olive oil and wait until the display reads "HOT" before adding the meat in. Also use pot holders to take out the inner liner and give the oil a good swirl before adding the meat because it will have settled around the edges. Let the meat sit on one side for at least 5 minutes before lifting up to see if it releases easily from the pan. If it doesn't, it needs another minute or two. When it's browned on the one side, turn it over and brown the second side. Remove it from the pot and set aside for a minute. 4. 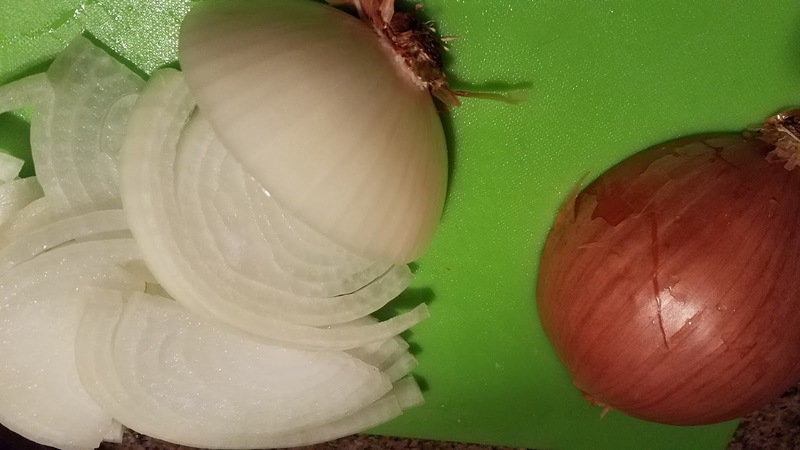 Build the layers and roast: Cut one medium to large onion in half and then into to 1/4 to 1/2 inch slices. These will start out as a nice little bed for the roast to rest on and then melt into delicious semi-oblivion in the sauce. 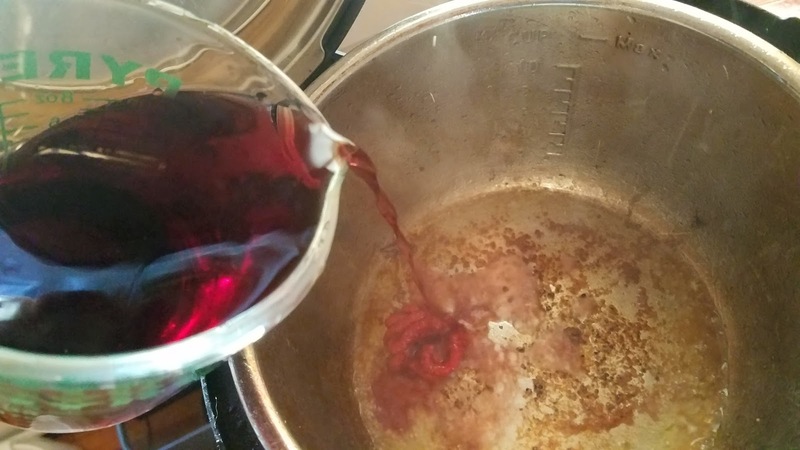 Lay the slices of onion into the reduced red wine at the bottom of the Instant Pot (it's possible that it has turned itself off of the saute function by now, and that's OK, but if that happens during the simmering, put it back on). Put the chopped reconstituted mushrooms on the onions, and then lay the browned meat on top of that. Being careful to strain out any dirty silt at the bottom of the mushroom liquid, pour that over the top of everything. 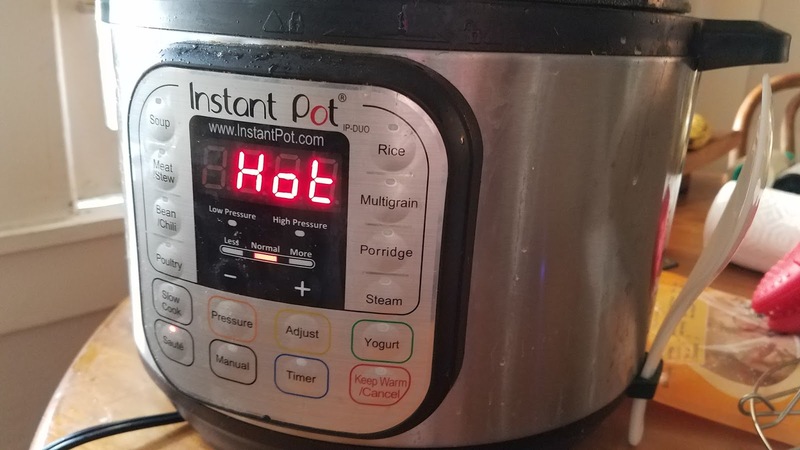 Set the IP on high for 55 minutes (for a 3-pound roast--add or subtract 5 min if you go up or down a pound in weight of meat). Lock the lid and let it do its thing, including 15-20 minutes of natural pressure release, before you open it back up. Do your fresh sides, clean the kitchen, or take a nap! 5. Slice and serve! 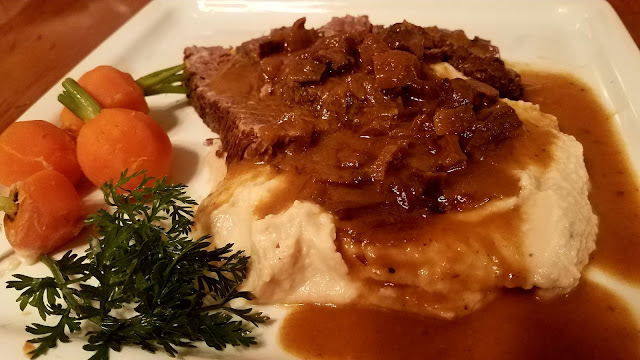 The pot roast differs from other long-cooked meats that are meant to be shredded or pulled in that it's served in beautiful slices. Remove the meat and place on a cutting board to slice up. Serve over mashed beans or potatoes with ladlefuls of the jus from the pot and your lovely steamed veg on the side. 6. Gravy thickening options: thickening up the sauce isn't necessary, but it can make the sauce even lovelier. -If you use cornstarch, you can make a slurry with 2 Tbsp of that and 2 Tbsp cold water. Stir into the jus before serving. 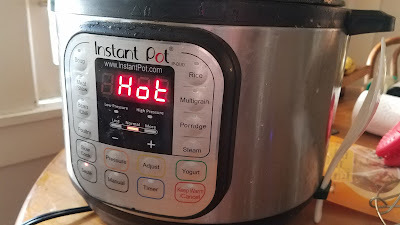 -If you are serving the roast later in the day or the following day, you can chill the whole pot in the fridge after letting it come down to room temp on the counter. 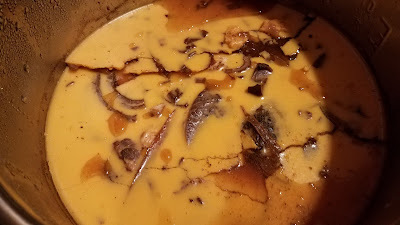 This will let the fat in the jus rise to the top and harden, and you can take some of that fat off to use in a roux (might as well keep italicizing the fancy French words). See that lovely fat? Take about 3 Tbsp of it off and melt it in a pan on the stove. 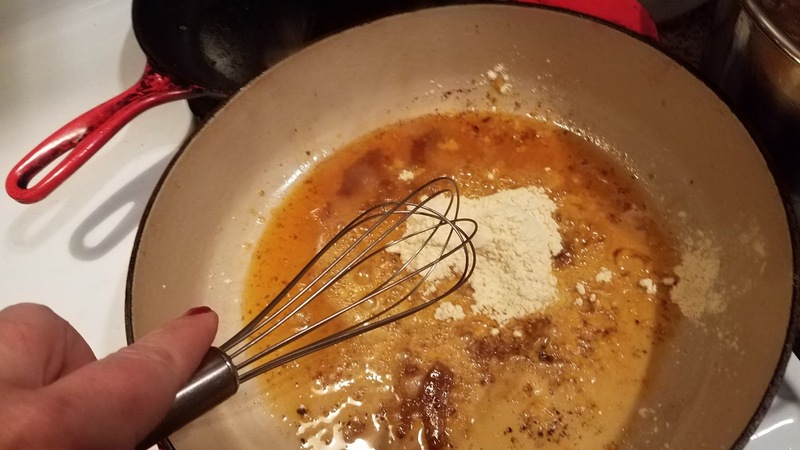 Whisk in 3 Tbsp chickpea flour (if you're an Always Hungry? devotee like me) or 3 Tbsp all-purpose flour and cook for 3-4 minutes until the flour taste is gone. You won't be able to see it turn from white to brown like a butter or oil roux, but why add additional fat when you can take it right from the dish? Ladle in the jus from the roast a little at a time until it's all incorporated. Taste for salt and pepper, adding more if needed. Now dig in already! I'm working on a warm wintery pot roast post, but in the meantime I got my CSA box and some new photo backdrops today, so I'm too excited to not post this! 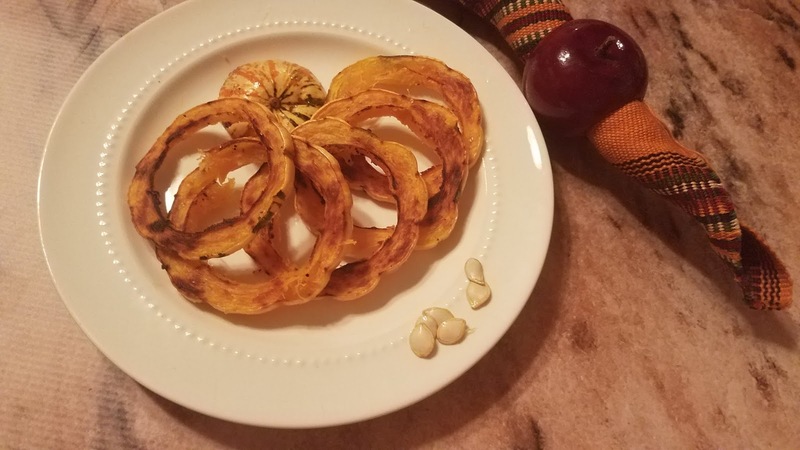 Delicata squash is beautiful and easy to prepare because you don't have to peel it. I'm sticking with my Instant Pot for butternut and pumpkin, but this beauty gets roasted in the oven. 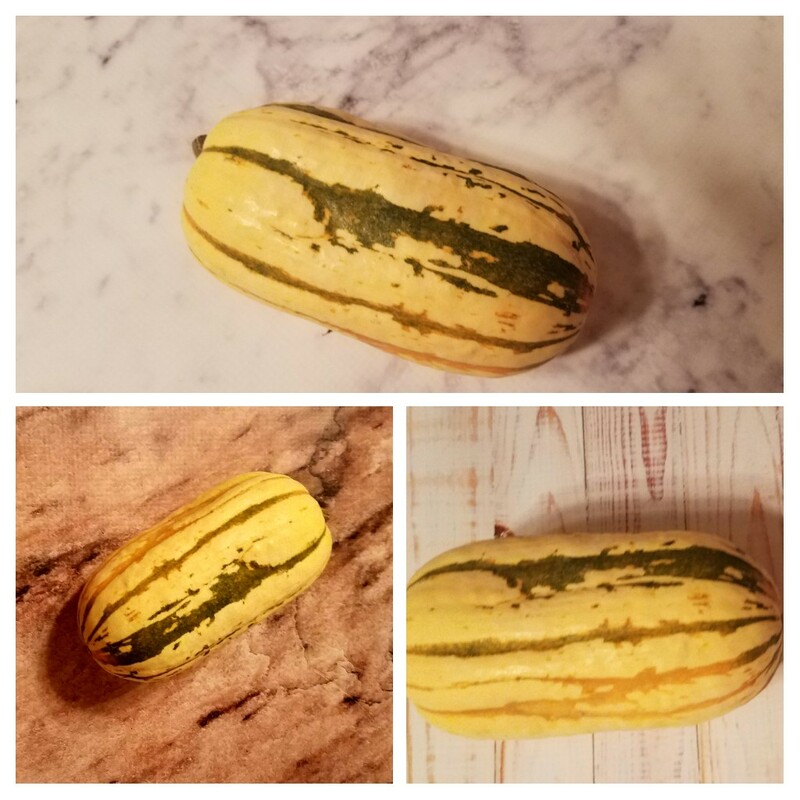 This particular squash looks like an abstract painting with pretty colors and ridges. Here is mine against my three new backdrops--hee hee. I tried to order two but once again missed the last confirmation click and ended up with a giant bunch of broccoli. Sigh. 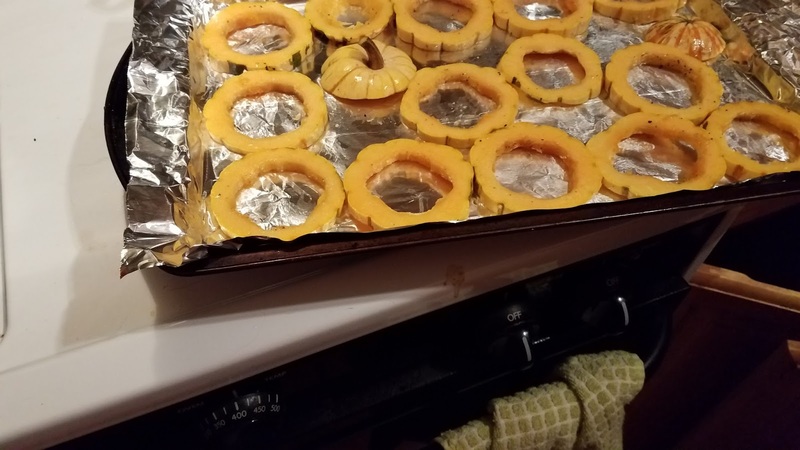 Preheat the oven to 400 and wash off the squash. Everything in my CSA usually arrives clean, but it's best to be safe. Slice it into 1/2 inch rounds and clean the seeds out of each ring. 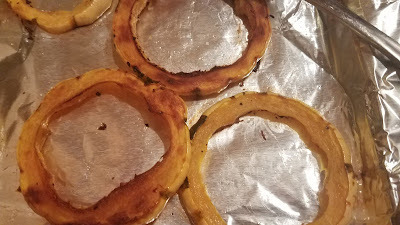 Put the rings in a bowl and drizzle 1-2 Tbsp olive oil over them. Sprinkle 1/2 tsp salt and a little black pepper, then toss the rings around to make sure the oil and seasonings are evenly distributed. 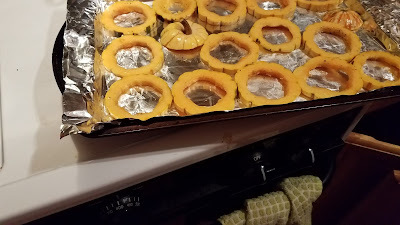 Line them up on a baking sheet, lined with foil if you want for easy cleanup. Roast at 400 degrees for 20 minutes and then check. They should be super soft so you can eat the skin easily--I got some that was underdone at a restaurant once and it wasn't pleasant. If they're not soft enough, turn them over and put them back in for 5-10 more minutes and check again. Because these were done in just the 20 min, they were only brown on the one side. Just put the pretty side up. No big deal. Serve with your favorite protein and a salad. I hope you enjoy them like I do. I just want to eat the whole thing, but I'm saving some for tomorrow.